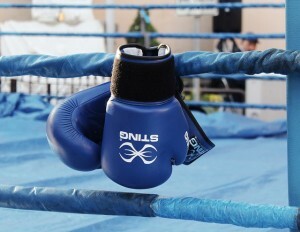 When thinking of boxing, the first thing usually assumed is that boxing is exclusively about punching. However, the true foundation of a highly skilled boxer lies in his feet. Or more precisely his stance. The fundamental boxing athletes stance places the lead foot forward with the feet approximately shoulder width apart. The rear foot is placed at a 45० angle with the heal slightly elevated off the floor. the lead foot should also be turned at the same angle. Bodyweight should be evenly distributed between both feet. the knees are bent slightly, and their should be a slight forward bend at the waist. This balanced, stable athletic posture, should prevent the boxer from stumbling by enabling the athlete to quickly and efficiently adjust his foot position and move in any direction. This stance allows to boxer to efficiently advance, retreat, lateral in either direction, and or pivot defensively off the lead foot. This in turn will often create new and more efficient avenues of attack, as well as enhancing the ability to deflect or completely evade an incoming attack. You might be surprised how much a boxers footwork resembles that of a dancer. However the key to successful boxing footwork is maintaining the essential structure of a boxer’s stance. The proper stance provides the basis of a boxers offensive/defensive fluidity, balance, leverage, timing and coordination.